This weekend found me back at Historic Deerfield, visiting "Celebrating Fiber Arts" for the second time. I noticed several things differently during this visit, and while drawn to many of the same garments, looked at them afresh. Among the many delights of this gallery is the opportunity to view many garments without the intermediary of a glass or plexiglass barrier. I would like to share with you, as closely as possible, what I was able to savor twice in the last six weeks. 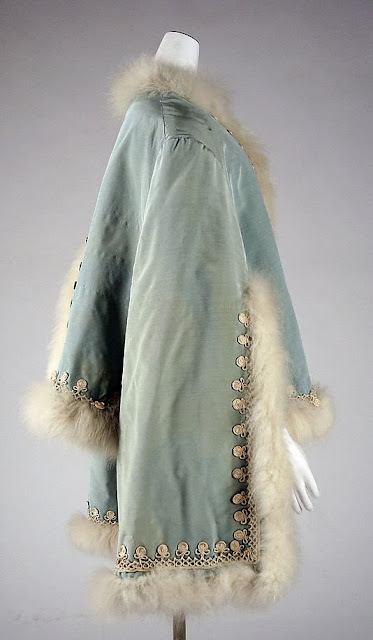 Not surprisingly, I was again attracted to the blue and cream/white Court dress, with its glorious textile and abundance of hand knotted floss or fly fringe. The luscious blue & white silk brocade was woven in Lyon, France, about 1760. The panniers (hoops or baskets) are expansive but by no means the largest protuberances we have seen. Indeed, as far as court dresses are concerned, there are numerous extant examples which exhibit far greater detail and expense. Perhaps this is in part why I find this garment so appealing - there is an accessibility to it. The palette is akin to the blue and white Delftware and Asian export ceramics which were widely mimicked and popular throughout the period, remaining desired to this day. 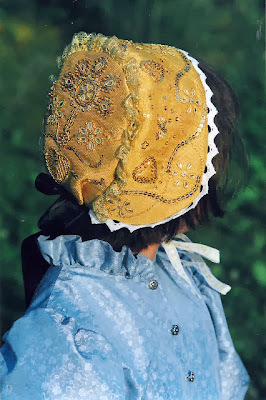 While the floss fringe is extensive - yards of it cover the bodice, trim the sleeves and skirt - it complements the silk brocade and is not jarring to the eye. 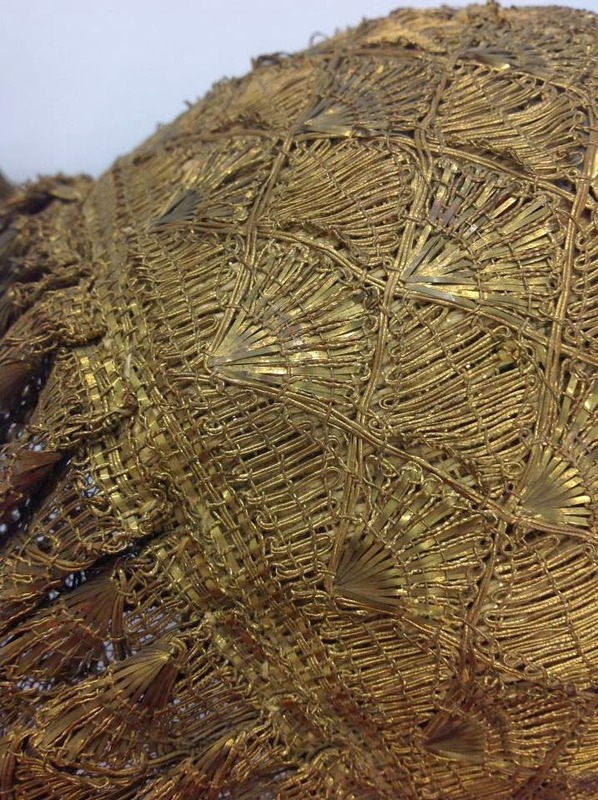 There is a pleasing balance and harmony in this dress, where all the parts come together to form a cohesive whole. A classic sensibility emanates from this garment, one that I imagine would lure many a contemporary visitor to take a closer look. The combination of the fabric, detail and width of the dress, demonstrate that it would have occupied its own space and makes the spatial requirements of one "at court" quite clear - whether it be promenading, conversing or even standing still. 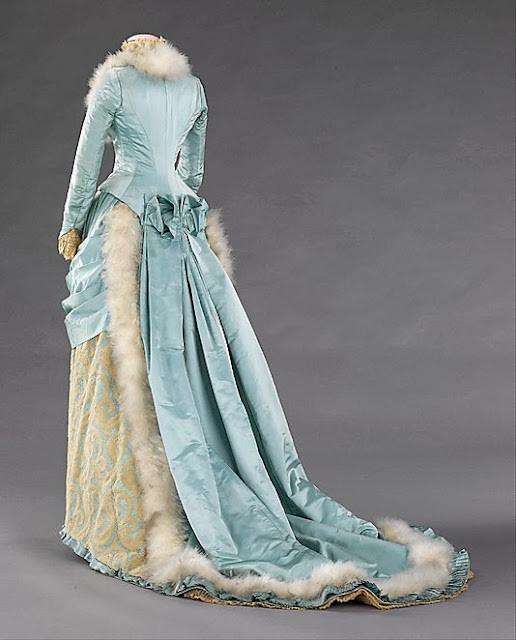 To be in the presence of this gown, on its mannequin, commands your attention. 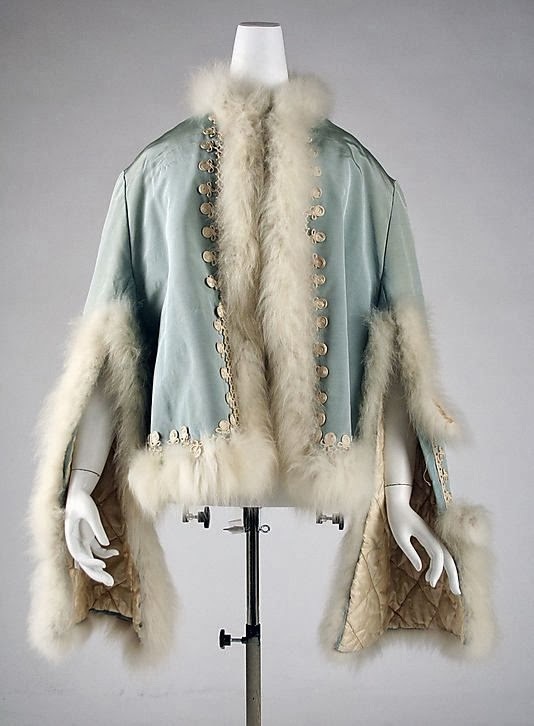 Two Victorian garments recently caught my attention – both are of a pale, icy blue silk, trimmed with soft white feathers, perfect for winter entertainments and galas attended by the late 19th century elite. 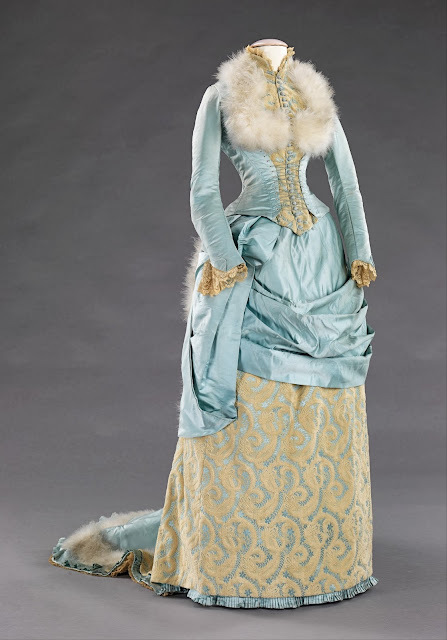 This fluffy, feminine evening gown of icy sky blue & gold silk, trimmed with feathers (perhaps eider?) is labeled "R.H. White & Co." one of Boston's premier shopping destinations well into the 20th century. 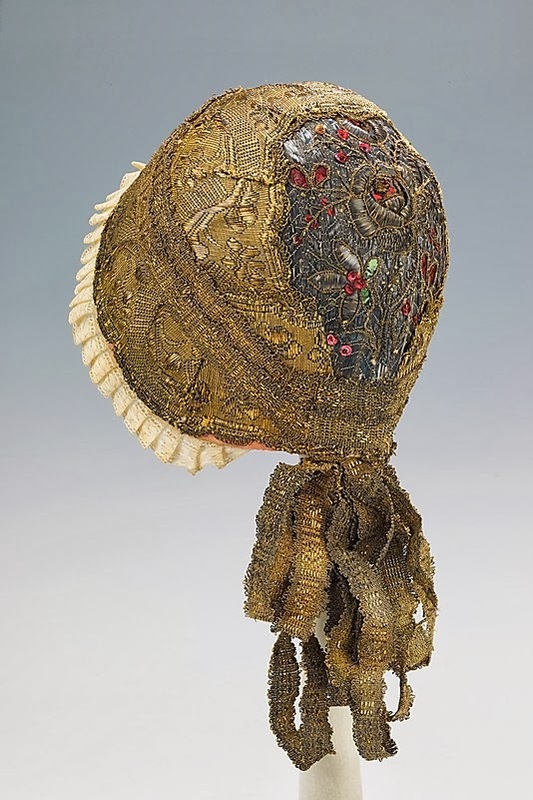 This well-designed head-turner was created during the 1880s. The feminine evening gown features a light palette, popularized after the 1876 Centennial Exposition in Philadelphia as "Colonial." Further, note the treatment of the gown construction, with a nod to the "petticoat." 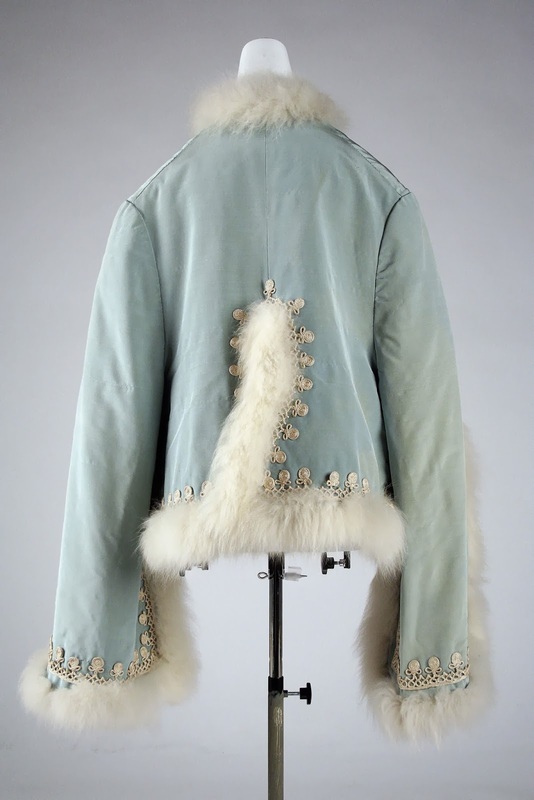 The designer was looking back to the garments of the previous century for inspiration. Perfect for evening Victorian soirees, can’t you just imagine its wearer making an entrance, all eyes turned upon her? Looking for another little statement to adorn your holiday attire? How about an frosty blue silk dolman? 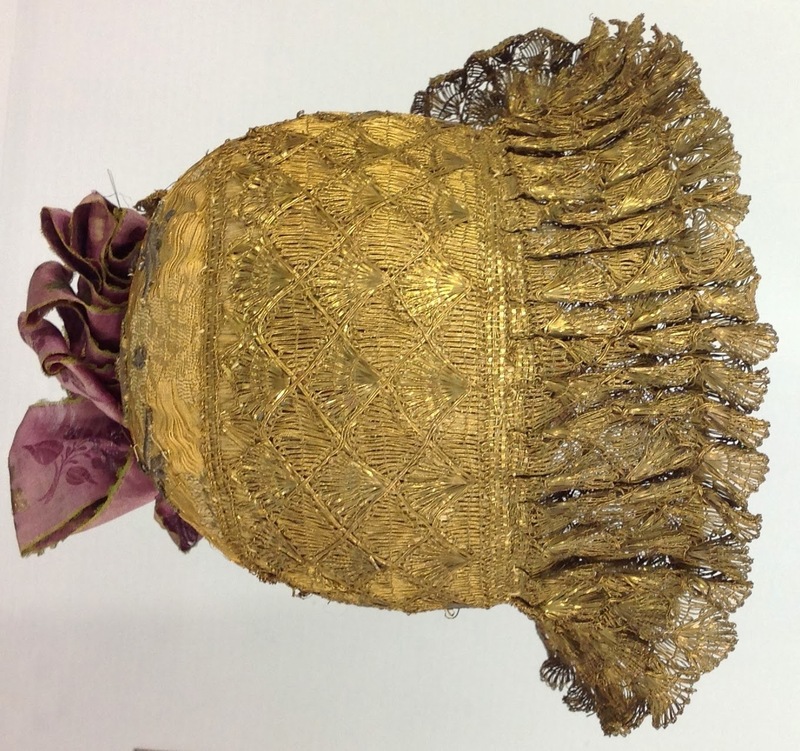 Intriguing and attractive garment from a skilled, but anonymous Victorian designer. Look at that sleeve! 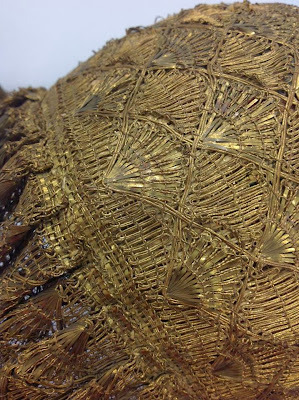 Ornamented with extensive metallic silk trim (with a militaristic bent) and soft feathers which together create a sort of ying/yang effect. Note the substantial quilting which would have afforded some warmth. 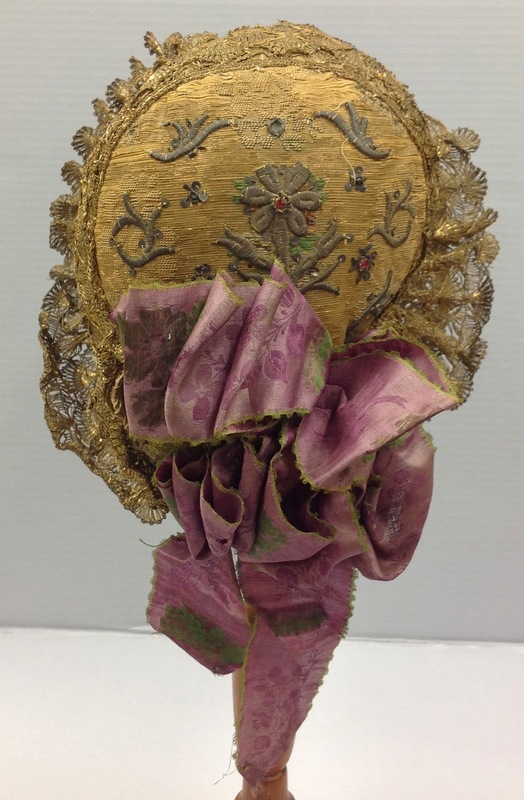 This is an American piece c. 1871. What accessories would you select? A feather muff or fan? When Miss Elizabeth Bull (b. 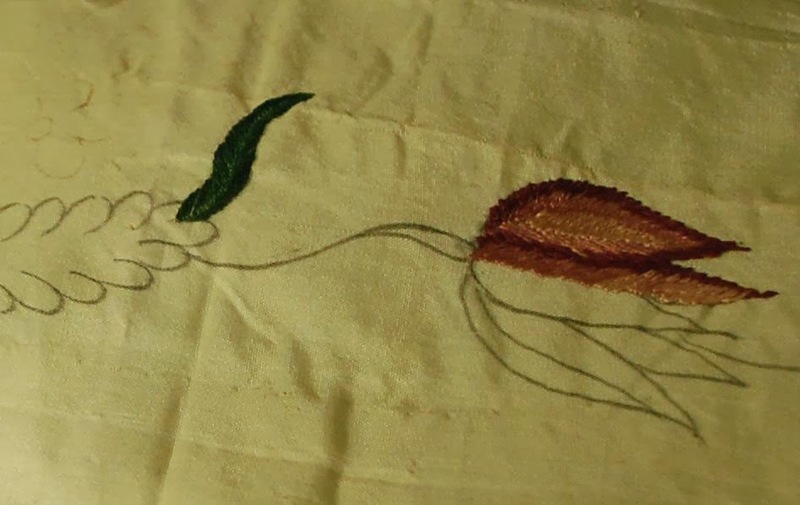 23 February 1716) began work on the dress that she would ultimately wear for her marriage to Reverend Roger Price, she was a teenager, probably about 15 years old. 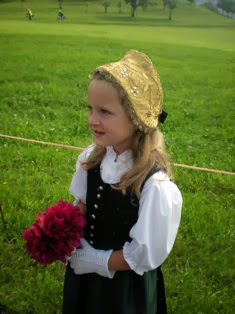 She most likely had not yet met, and was certainly not betrothed to, her future groom. 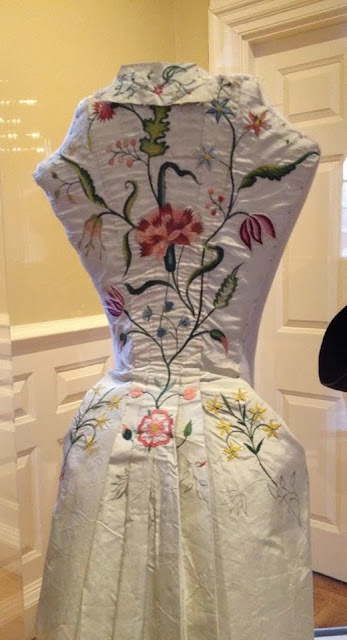 According to The Bostonian Society (TBS), the caretakers of this rare pre-Revolutionary garment: "Miss Bull began designing, sewing, and embroidering her own China silk wedding gown while in school, a project undertaken by young women to practice and perfect the advanced needle arts. She had already been working on the gown for several years when, in 1734, she met Reverend Roger Price at Trinity Church. 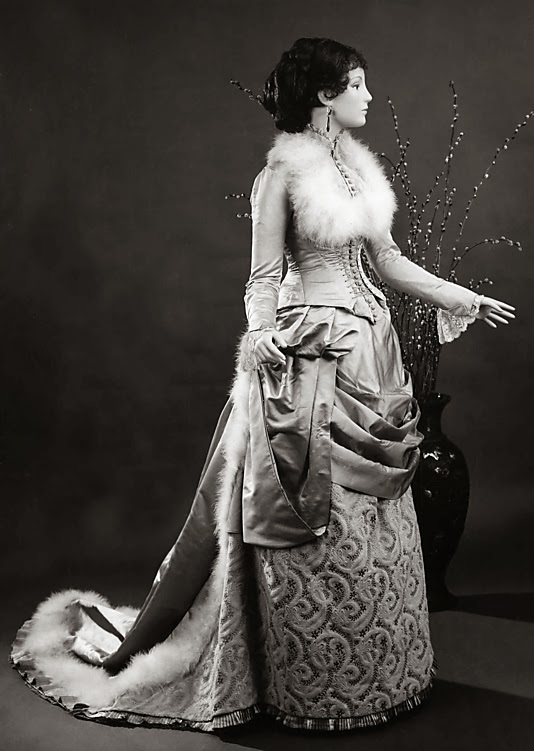 The gown was still not completed when Miss Bull wore it to their wedding the following year." Visiting at least a portion of the dress as it was intended – before the style driven alterations during the 19th century – provided a special opportunity to experience a 1730s garment. Embroidered bold, bright floral patterns, laid out asymmetrically, dominate the “practice bodice” currently on view at TBS. 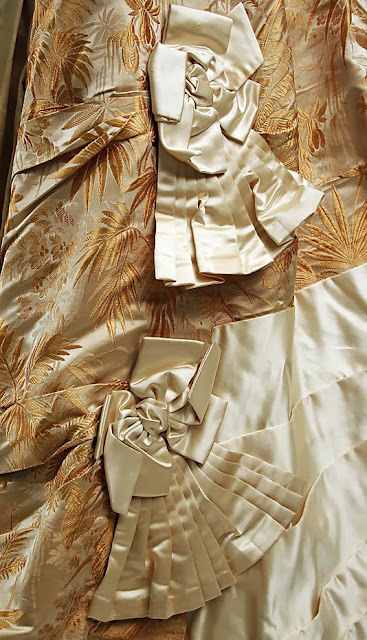 The twisting tendrils, over-sized motives and powerful palette are associated with the Rococo in textiles, furniture and wall coverings and hangings. Above, details, hand embroidered floral details, silk thread on silk. 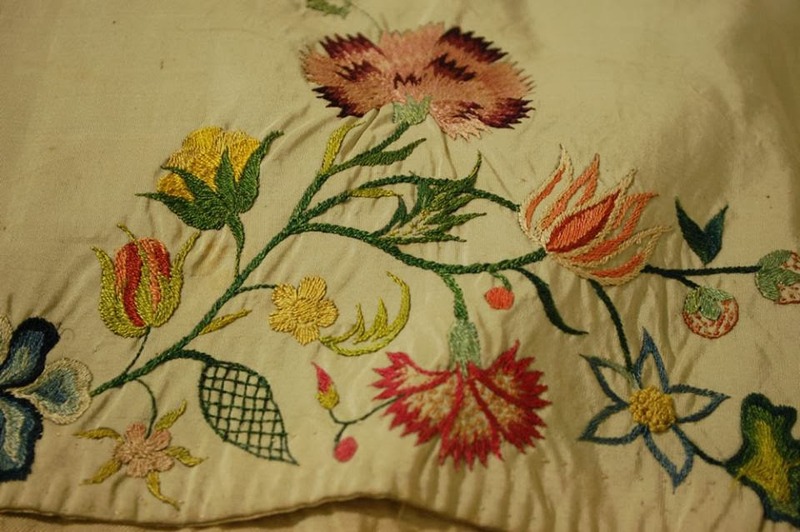 Note the hand drawn pattern, completed either by the young Miss Bull or an experienced family member or instructor to guide her embroidery. 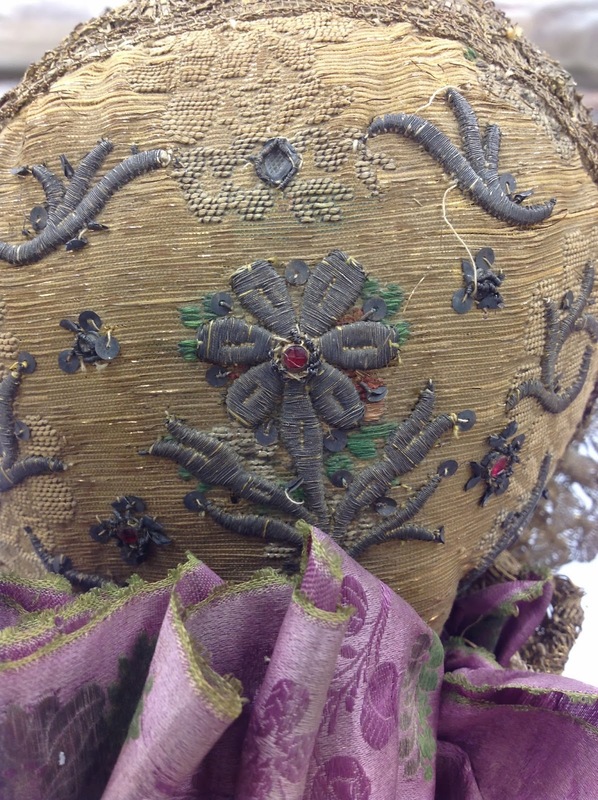 The Bostonian Society/Old State House has undertaken major conservation of this significant gown and will be posting new information as it becomes available. Peter Cunningham, Handbook For London, John Murray, London 1849, enlarged 1850. 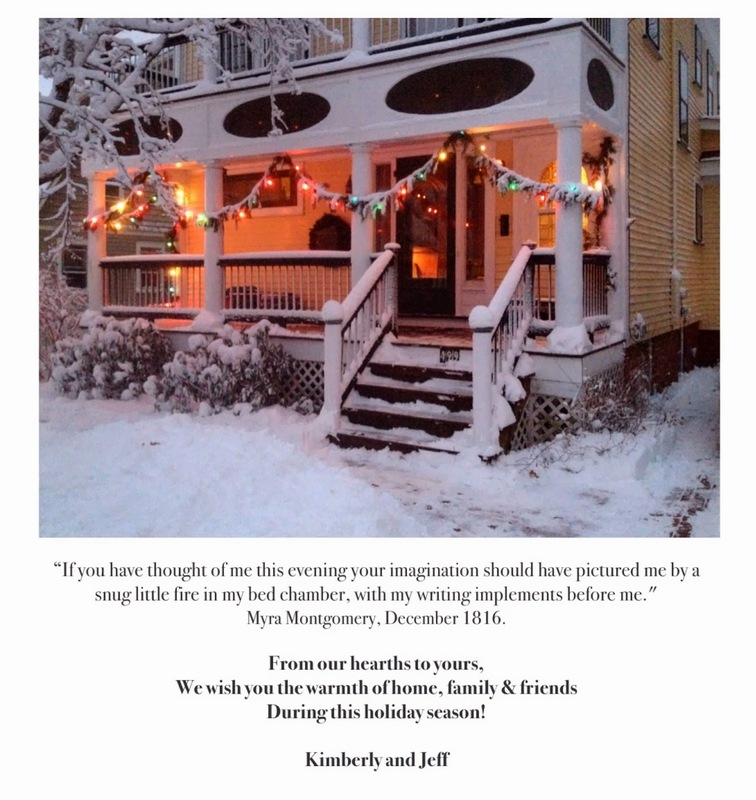 Jeffrey Hopper is an editor, independent scholar and frequent writer on men's wear and related topics for SilkDamask. This is going to be a simple post but one that sums up the opportunities we have before us in this technological, image-driven age. There is nothing new here–-just a short tale of how connected we can be and the ability we have to make connections across countries and cultures, which were absent or laborious, at best, for previous generations. For historians of material culture and costume history like myself, the technology opens doors that had been shut. 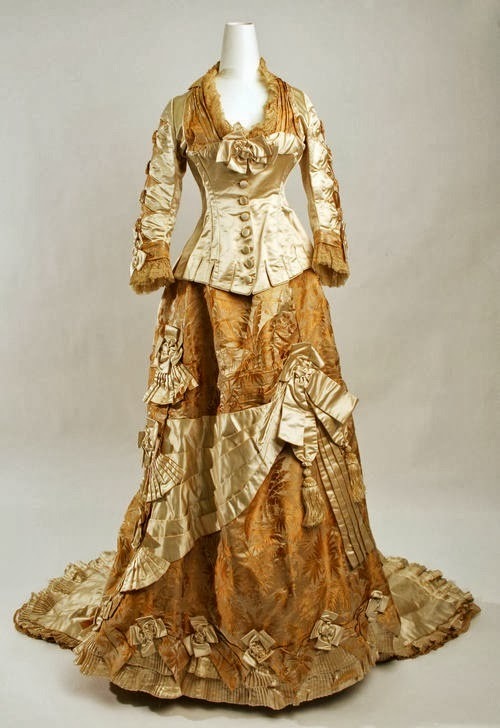 This morning I posted this lavish, lovely 1870 wedding dress from the collections of the Metropolitan Museum in NYC, USA. I shared it on Twitter and Facebook, as usual. 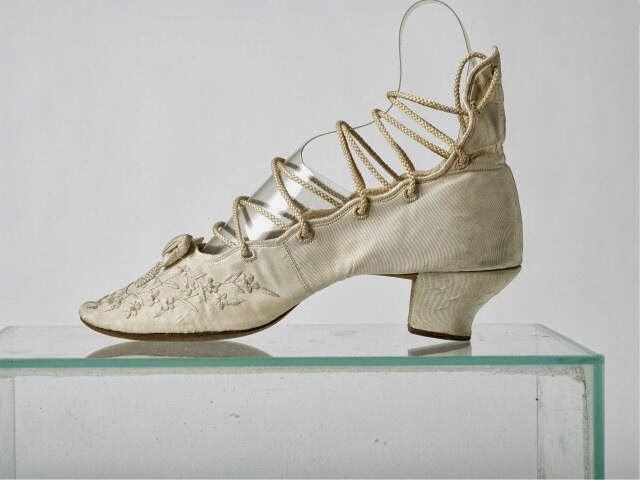 Not only was the response a staggering number of shares and retweets, but I was delighted to find that The Shoe Museum, Somerset, UK (Clark's shoes) kindly went through their vast shoe inventory to locate and send along an image of these dreamy shoes (1879) to accompany the wedding dress. 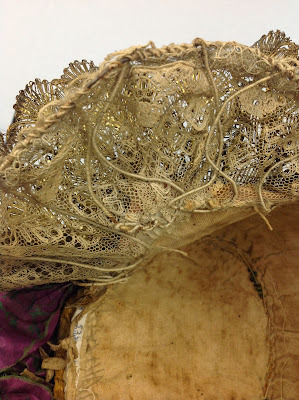 The cream ribbed silk, embroidered with silk and pearls would have provided a perfect counterpoint to the gown. 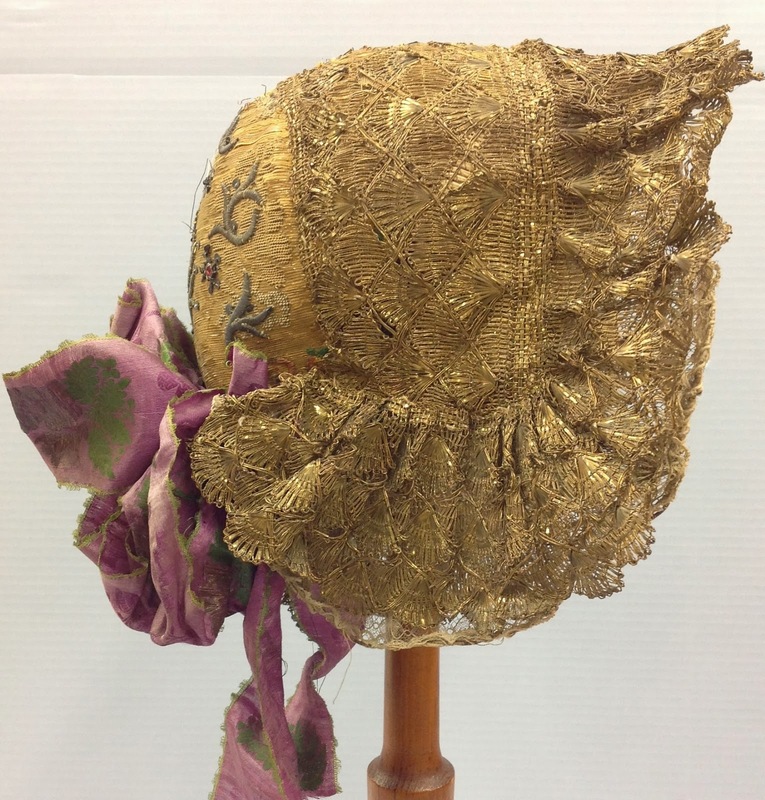 Despite being worn separately, they convey a sense of the Victorian era on both sides of the Atlantic–-shared impulses of style & fashion, fabrics & finishes. Part of my research this weekend transported me to 18th century London via trade cards and broadsides. One of my favorites is "the old Frock-Shop." The proprietors were Mary (1699-1741) and Ann (1701-1771) Hogarth, sisters to the famed William Hogarth (1697-1764). The sisters appropriately appear as forthright women of business- their dress suggesting some measure of success but not excessive; their facial expressions erring to the serious and matter of fact. Hogarth, best known for his satirical engravings and "Modern Moral" subjects, engaged in multiple aspects of his trade in his early years, including learning to chase salvers and tankards. Even in his 1730 trade card for his sisters, you sense he is somewhat bemused by the subject he portrays. A youth and his family are gathered round and appear to be engaged in a bit of drama, with arms gesturing. The gentleman is wearing a long coat with turned back cuffs and the indication of fancy stitching at button holes and pockets. The sisters sold "ready made frocks…stript Dimity & Flanel Waistcoats." A coat hangs in the background and what appear to be vest pieces or patterns are on the table to the right. You can just make out Hogarth's name in the lower left, as well as that of his frequent collaborator, engraver Thomas Cook. A number of excellent London trade cards are published online at www.spitalfieldslife.com. 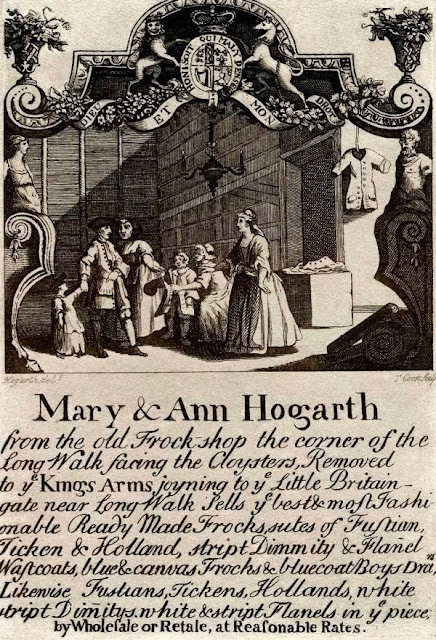 What may be an example of Hogarth's earliest work is his own trade card from 1720, in the collection of the Bodleian Library (bodleian.ox.ac.uk). While the iconography may appear somewhat pedestrian, he had just started his career and needed to demonstrate his abilities for a wide range of potential clients. 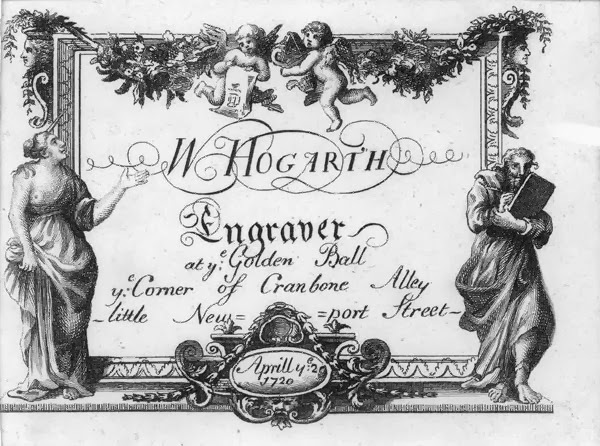 Hogarth, like many other engravers who went on to success, were "jobbers" to the trade for bread and butter money.